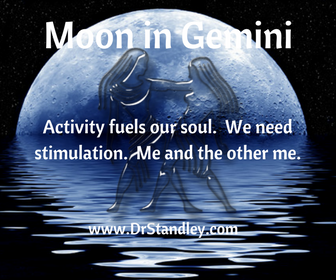 The Moon is in Gemini until Thursday, May 17, 2018 at 5:47 PM EDT. THE BIG NEWS today is Mars makes his move into Aquarius at 12:55 AM EDT and Mars squares Uranus at 3:03 AM EDT. 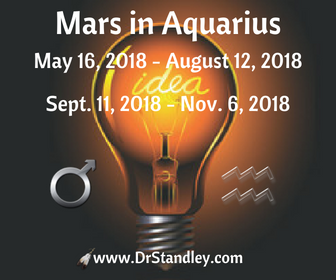 A Mars transit in any sign typically last six (6) weeks, but this transit of Mars in Aquarius will last six (6) months from May 15, 2018 until August 12, 2018 and then from September 11, 2018 until November 15, 2018. This is due to a Retrograde (Rx) period of Mars from June 26, 2018 until Mars turns Direct on August 27, 2018. 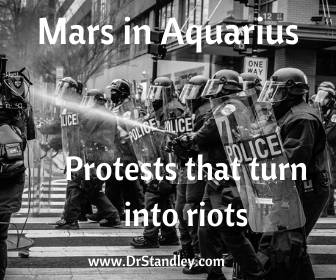 Make certain you read the monster-size write-up for Mars in Aquarius because this transit is not only the transit of protests that turn into rioting, it is also the 'mark of the 'genius idea'. Keep in mind the last time Mars entered Aquarius was on November 9, 2016 just one day after the election of President Trump. Do you remember how I wrote about the rebellion-hellion that would be taking place? And do you remember the rebellion-hellion that took place? That transit of Mars in Aquarius lasted until December 19, 2016. That transit lasted 40 days (well that's interesting number of days) and this time it will last six (6) months. After you read the monster-size write-up for Mars in Aquarius make certain you read use the downloadable chart wheel to lay over your personal natal chart to see where Mars in Aquarius impacts you personally, rather than as an entire population of people under one Sun Sign. After I finish posting this 'Extended Daily Horoscope' I will buzz over to your Monthly Horoscope to update Mars in Aquarius for each Sun Sign. So give me just a couple of hours to get that complete this morning and you will be set. Today we also experience Mars Square Uranus. This is another long impact on us as this energy actually began in applying (approaching) degrees on April 26, 2018, it is exact today and it will last in separating degrees until August 1, 2018. This aspect behaves like it is squaring itself because Uranus naturally rules Aquarius, which is now in Taurus but square Mars in Aquarius. This makes it a double-misfit. While the Astro Meme shows 'Buddy the Elf' excited and enthusiastic, let us remember that 'Buddy the Elf' was over-the-top excited and enthusiastic. This aspect carries an enormous amount of energy that needs to be kept in-check, under control and exhibiting some sort of self-restraint. 'Buddy the Elf' did not know how to do any of that. Everything was over-the-top! I'm a person who believes in, "If it's worth doin', then it's worth over-doin'" but this aspect is clearly just too damn much over-doin'. This aspects wants and TAKES the freedom to do as it pleases, when it pleases. 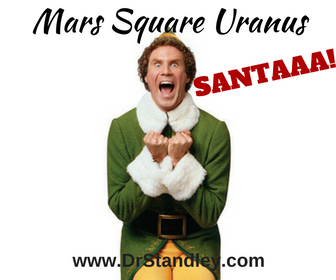 Mars Square Uranus has a voracious appetite for action and excitement. This can result in being accident prone because the energy is a bit careless and is not taking into account what 'could' go wrong. Since Uranus rules electricity, then take extra-care with electrical devices. Also keep an open-eye with any activity associated with daring stunts or occupational hazards such as - racing cars, speed boats, machinery, and other dangerous activities. This aspect reveals dangerous and sudden action that craves excitement and 'the chase'. Remember, this aspect will last until August 1, 2018 even though it is exact today. This is the aspect of the thrill-seeker and one who acts with reckless abandon. Remember, 'Buddy the Elf' could get angry, pout and then act out. So can you, so watch this aspect closely in your own Life. Coupled with Mars in Aquarius, this aspect has the desire to overthrow established authority just for the hell of it and cause a revolution, just because it can. This is rebellion-hellion right alongside Mars in Aquarius. It's going to be a wild summer to say the least! Download the 'Mars in Aquarius' chart wheel here! Download the 'Mars Square Uranus' chart wheel here! Mars moves into Aquarius at 12:55 AM EDT and last until November 15, 2018. Mars in Aquarius square Uranus in Taurus at exactly 3:03 AM EDT. This aspect began on April 26th, it is exact today, and it will last until August 1, 2018. The Moon in Gemini square Neptune in Pisces at exactly 7:17 PM EDT. You will feel this energy within 12-14 hours 'before and after' it occurs.